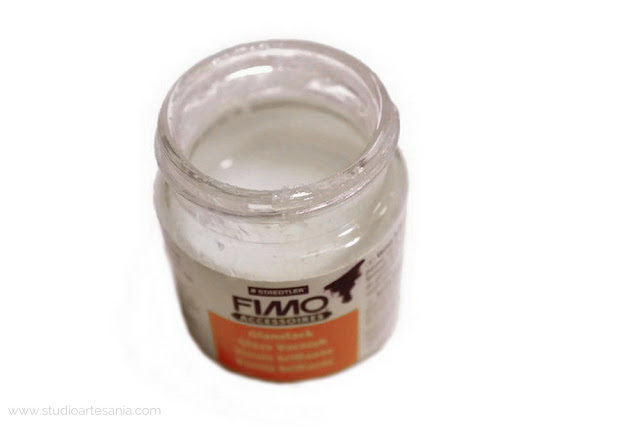 How to use Fimo varnish on polymer clay? Varnishing of polymer clay creations in most cases is unnecessary. After polymer clay is properly baked it basically becomes plastic, so you do not need to varnish it. Most of my polymer clay pieces are not varnished at all, they are only well-processed (buffed and polished). But, sometimes varnishing is very useful, especially when our pieces contain mica powders, metal leafs, chalks, or acrylic paints that can be damaged and piled off the surface during the time and frequency of use. Varnishing is the best way to protect additional materials that we apply on to polymer clay. Although there are few varnishes and sealers for polymer clay on the world market, they are not available in my country. Since Fimo is (unfortunately) only available clay in Serbia, that ordering of other brands from shops abroad is quite costly due to postage and customs duties, and that Fimo varnish works best with this brand of clay, I use what I have. During the years (and after many mistakes) I mastered application of Fimo varnish on clay, so I decided to share my trade secrets and to explain how to properly varnish polymer clay with it. 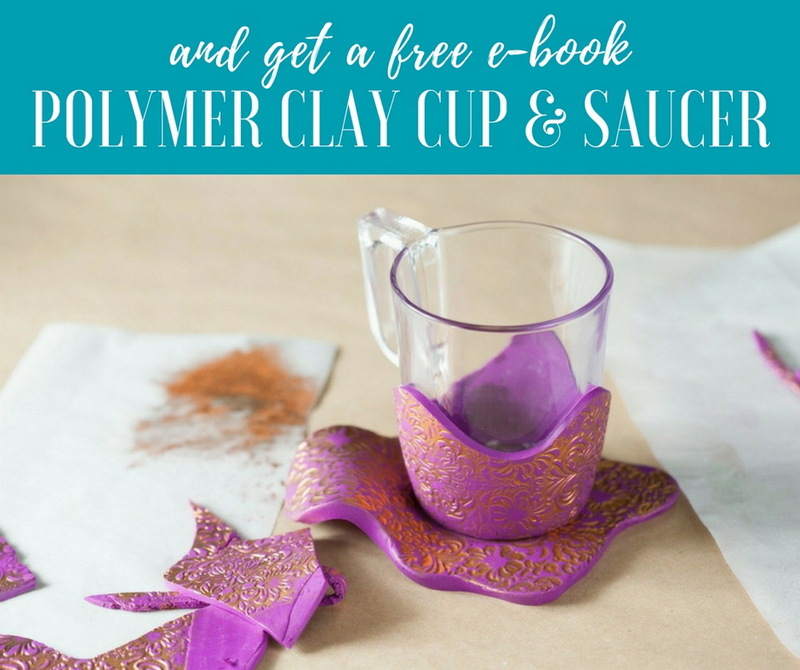 This tips will be especially valuable for polymer clay beginners, but I'm sure that experienced clayers will learn something new too because I know that some of them are complaining about cloudiness issues with this varnish. FIMO varnishes are white liquids that become colorless and translucent after proper application and drying. They are made on a water base and have medium intense scents in comparison to other varnishes used in the art (eg, painting). The smell is pleasant and not irritating, at least to me. Given the minimum amount we use per piece, Fimo varnishes can last for quite a long time. Even during long stays in the original packaging, which is made of glass, they will not evaporate, tighten, thicken or change properties. What Fimo varnish to select? The choice will depend solely on your needs and wishes, or on what effect you want to achieve. • Semi-gloss - available in a package of 35 ml (1,18 fl oz). The Gloss Fimo varnish, besides protection, gives to our creations a medium-intensity glow. After drying, it does not gleam and shins, but its bright effect is noticeable in the game of light. It is excellent for jewelry and everything from polymer clay where you want a dose of gloss and an apparent look of depth. 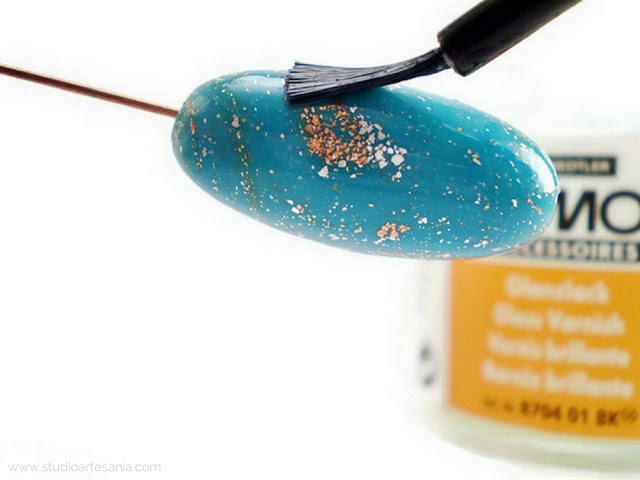 Semi-Gloss Fimo varnish is intended for the protective coating of applied materials on sculptures, especially polymer clay dolls whom often have chalks and paints on them (eg, eyes and chicks). There is no glow so the dolls with applied chalks and paints will have the more natural look of human skin. 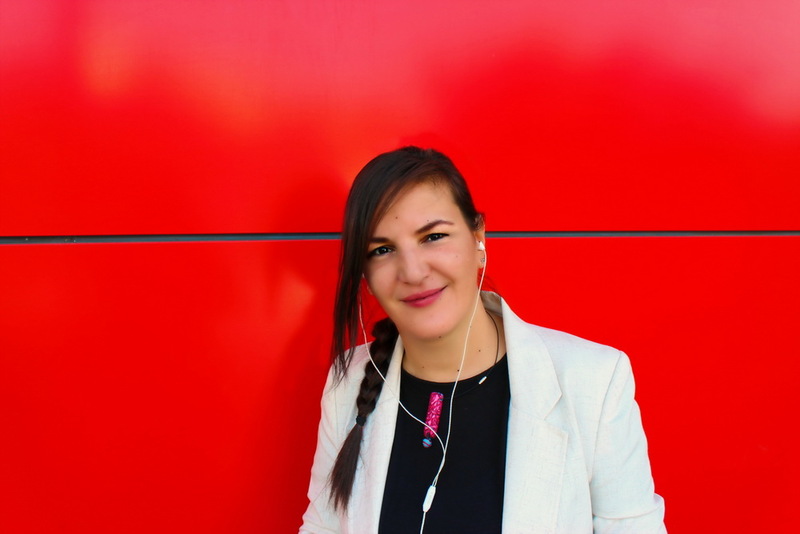 You can also use it for jewelry or other items when you want your creation to be protected, but to retain the matte look. Of course, you can use a regular paintbrush. But, the problem with paintbrushes, no matter if it's cheap or high-quality one, is that they tends to capture a bigger amount of varnish than necessary which lead to cloudy appearance some clayers complain about. They are, also, harder to clean and they can leave hairs and weird stripes on the varnished piece. Plus, a high-quality paintbrush costs a lot of money, and you definitely don't want to destroy it during polymer clay varnishing. 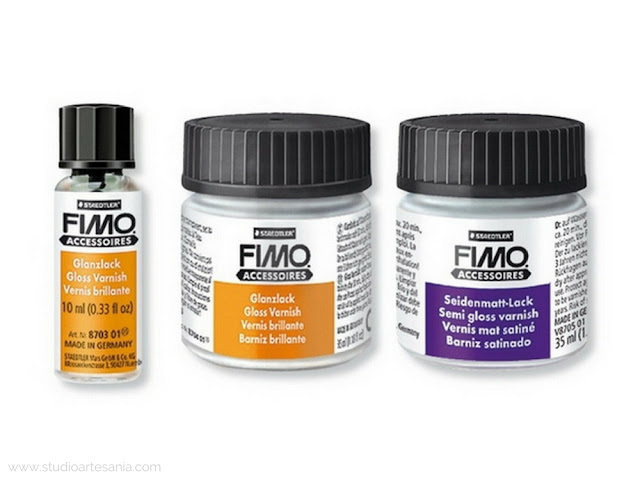 Regardless of whether you are using a gloss or semi (matt) varnish, I recommend you that, especially if you are a beginner, first of all, get a package of 10 ml (0.33 fl oz) Gloss Fimo varnish. The reason is that brush, with which you will achieve the best results and evenly apply the varnish, is an integral part of its cap. In a large package (35 ml/1.18 fl oz), you will not find a brush, so consider buying a smaller pack as an investment in the required polymer clay tool. Once you get the brush, later you only need to purchase a large package of the desired (or both varnishes) as a supplement. So, if you take into consideration that your Fimo brush with proper maintenance can last for years, it can be used to apply both gloss and semi varnishes and that the coatings with it are more uniform and quality, it turns out that buying of 10 ml (0.33 fl oz) package is a definite saving. 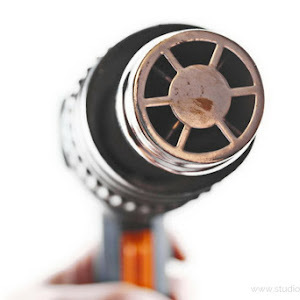 After you use up a varnish from a small package, rinse the brush and the bottle with cold water. Fill the bottle with the clean water and keep a brush in it. This way brash hair will not stiffen and harden. Once a month or when you notice that the water in the bottle is clouded (it becomes almost white), rinse it again and pour clean water. Also, rinse the brush after each application of the varnish, especially if you, like me, alternately use gloss and semi varnish. This way the brush will last for years. And, if properly maintained, you can use it to apply both Fimo varnishes. Fimo varnishes must be applied to the baked polymer clay. Also, the surface you want to varnish must be dry and clean. Our skin contains a certain amount of grease that your hands can transfer to the clay, especially if our palms are prone to sweating. Never apply varnish to the oily (greasy) clay, because varnish will not stick well and eventually it will peel off. Therefore, before varnishing you should wipe your creation with a cotton pad on which you have poured a few drops of 70 % rubbing alcohol. 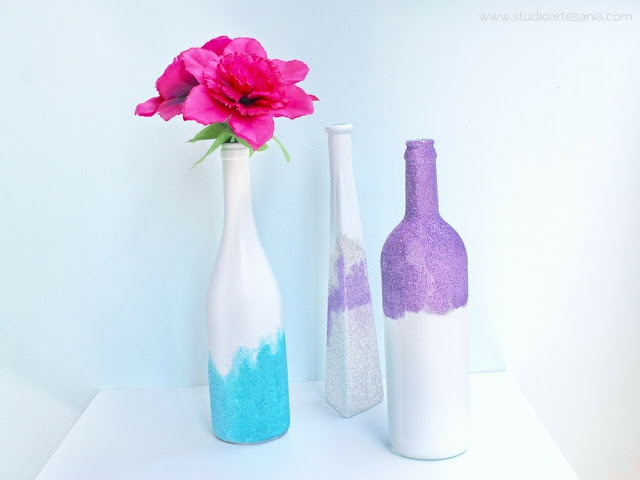 Keep in mind that certain techniques, such as those where you use mica powders or chalks, do not stand this kind of treatment, so omit the cleaning of that part of the creation. 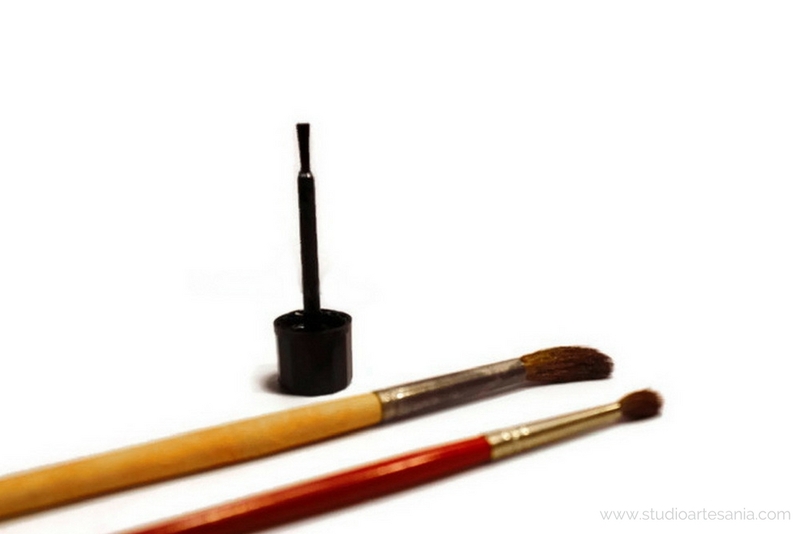 Before you start to varnish your polymer clay creations, make sure to dry the brush with a paper towel. 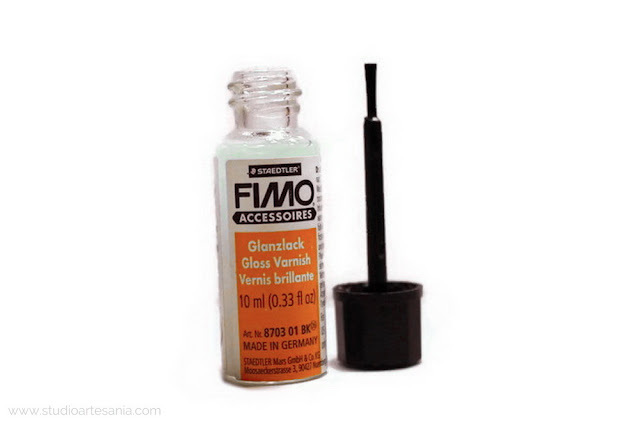 This is necessary because additional water from the brush (if stored in the manner described above) can dilute Fimo varnishes (which, I repeat, are made on a water base) and thus destroy your piece. Always apply a very, very thin layer of varnish on the clay. It is important that the brush is not soaked with varnish. 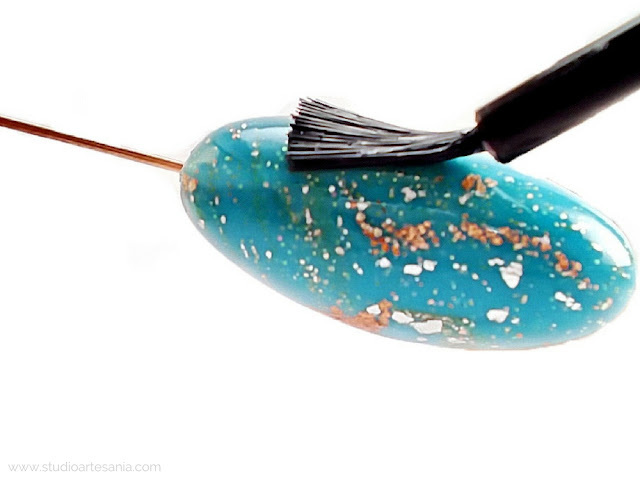 It is best to soak the tip of the brush into the varnish you have chosen to apply on your creation and remove the excess varnish by putting the brush on the edge of the bottle (as you would have done with a nail polish). The brush should look almost as if it is dry, that is as if there were no varnish at all on it. For more intense shine, you can apply more layers of varnish. You need to let each coat of varnish to dry before applying another one. It is better, regardless of which Fimo varnish you use (gloss or semi), to coat the clay with several very thin layers, then to apply a thick layer of varnish at once. If you apply a larger amount of varnish you will notice during the drying that the varnish begins to shrink in certain zones, leaving some places of our creation unvarnished. In those zones varnish becomes clouded and after drying it can be easily peeled out. That is the reason why some of the clayers have issues with this varnish. So, keep in mind to always apply a thin layer of varnish. Fimo varnishes are dry to touch after 20 minutes, and the varnished object is completely dry after 24 hours. Dry to touch means that after a period of 20 minutes you can touch and move the varnished piece, as well apply a new thin layer of varnish to it. Before applying a new layer of varnish it is necessary to leave the object to dry for 20 minutes. If you have made a piece of jewelry, 20 minutes after applying the last coat of varnish, you can connect the pieces with jump rings and other components. But, before you use (wear) that piece of jewelry be sure to leave it aside for 24 hours to dry completely. If you have accidentally applied a thicker layer of varnish during the first coat, you can correct this, but only before the expiration of 20 minutes required for drying to touch. You will do this by washing the varnish under a jet of cold water. This procedure is completely useless and meaningless after drying period of 20 minutes, as well as after applying another (second) or more layers since the varnish is no longer soluble in water. After washing off the varnish you have to repeat all the steps - wipe the water with a paper towel, clean piece with rubbing alcohol and re-apply the varnish. 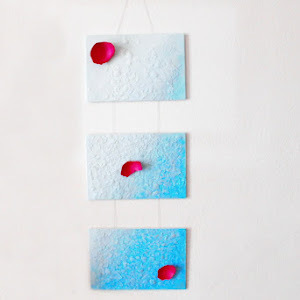 But, know that some techniques do not handle water well, and by using this method you can ruin your piece, so it's better to leave an irregularity than to ruin all the effort invested in the creation. Fimo varnishes are made on a water base, which means that they contain acrylic, so those who are allergic to this substance should varnish the clay in a well-ventilated room, and wear gloves and a protective mask during application, in order to prevent any possible reaction. The same safety precautions they should take when working with acrylic paints because their base is similar to that in Fimo varnishes. However, this allergy is not so common, and the possible reactions usually occur only in the case of fresh acrylic (until it dries). As the application and drying of varnish are performed relatively fast, with the mentioned safety measures, the possible reactions are minimized. If you are allergic to acrylic and the proposed measures do not help you, it is best to ask someone else to do varnishing for you or to leave your pieces unvarnished. 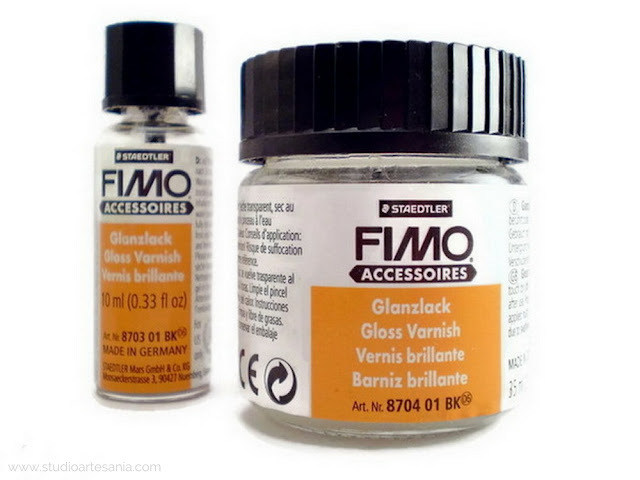 • Even I successfully use Fimo varnish on other clay brands, keep in mind that its primary intended for Fimo clays (Professional, Doll, Soft, Effect). By implementing steps described in this post you will archive great results when varnishing any of the Fimo clays. 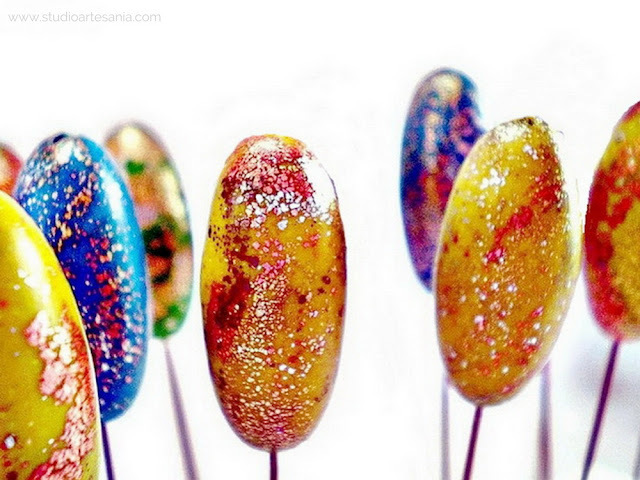 • If you like the beads shown on photos you can learn how to make them in this tutorial.